Above: Congressman Josh Gottheimer (NJ-5) addresses the congregation at Keter Torah in Teaneck. TEANECK – In the aftermath of the deadly attack on worshipers at the Tree of Life synagogue in Pittsburgh, PA, Congressman Josh Gottheimer (NJ-5) visited congregations across North Jersey to mourn the devastating tragedy and reaffirm the Fifth District’s commitment to combating anti-Semitism and protecting houses of worship. At Congregation Keter Torah in Teaneck on Sunday, Congressman Josh Gottheimer joined Dr. Mort Fridman, President of the American Israel Public Affairs Committee (AIPAC) to pledge to continue working to protect temples and synagogues by securing grants to better protect our community. Congressman Gottheimer also joined Senator Cory Booker and Congressman Bill Pascrell (NJ-9) at a vigil for the Pittsburgh victims at the Kaplen Jewish Community Center on the Palisades in Tenafly. 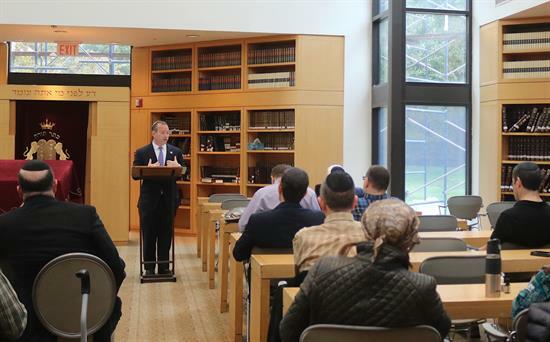 This summer, Congressman Gottheimer led a Synagogue Security Summit with experts from the Federal Bureau of Investigation (FBI) and the New Jersey Office of Homeland Security and Preparedness. At the summit, Gottheimer cited the nearly 60% surge in anti-Semitic incidents in the past year – pointing out that New Jersey experienced the third-highest number of those incidents in the nation. Congressman Gottheimer has also worked across the aisle in Congress to combat disturbing uptick in bias, intolerance, and hate crimes against Jewish institutions. He led 11 other members of New Jersey’s Congressional Delegation in writing a letter to Congressional leadership, requesting a funding measure for the Department of Homeland Security and Department of Justice for their programs to better secure Jewish Community Centers (JCCs). Video from the Congressman’s visit to Congregation Keter Torah can be found HERE.